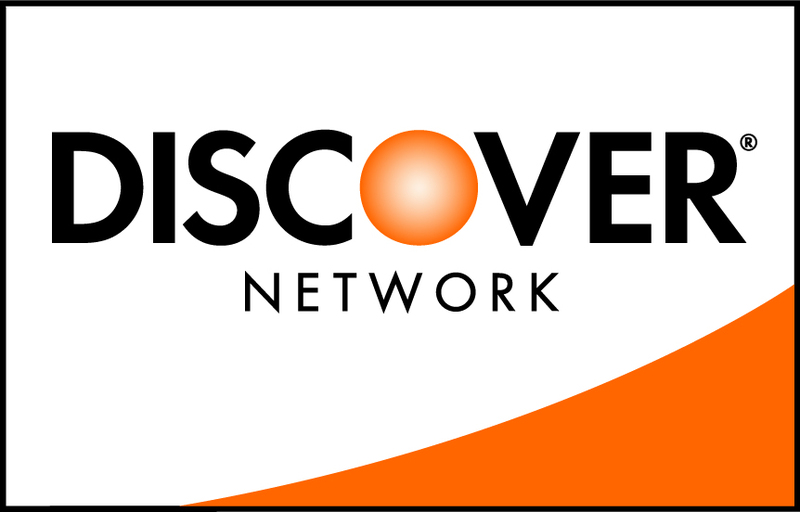 Thank you for contacting us! 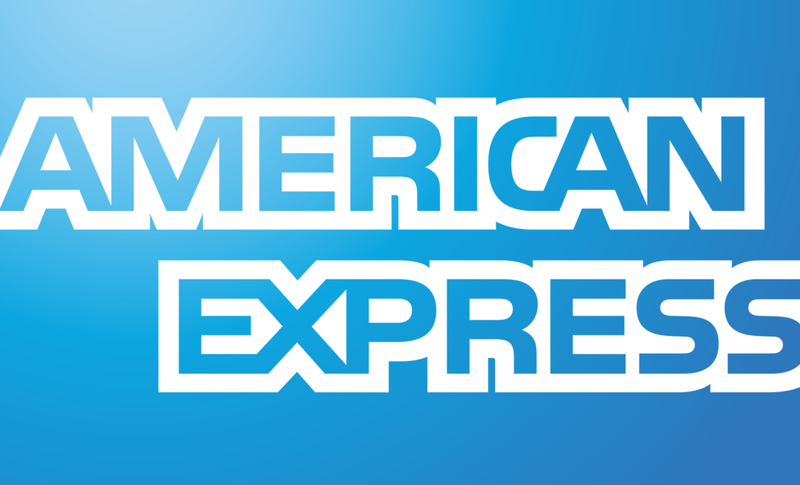 One of our customer service representatives will be in touch shortly. 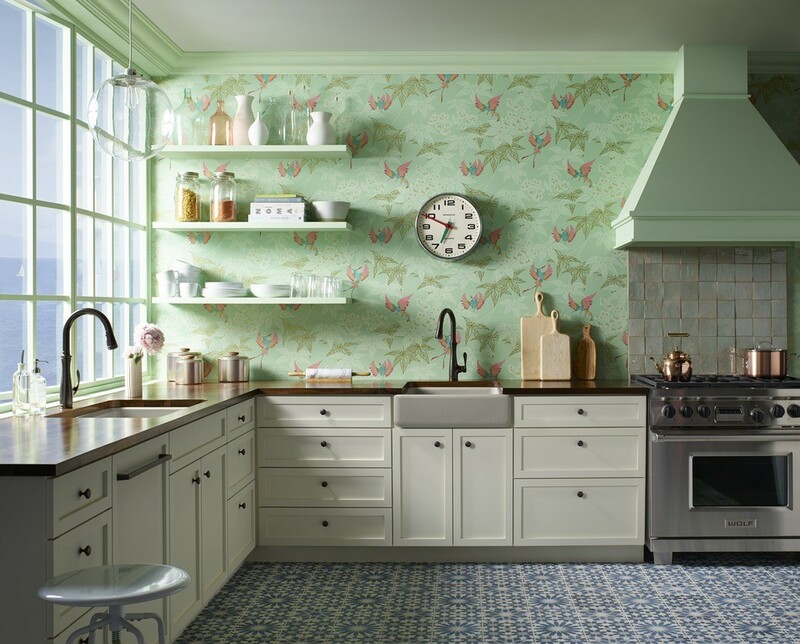 An eclectic blend of textures, colors, and materials takes center stage in this warm, livable kitchen, where pattern is seriously at play. 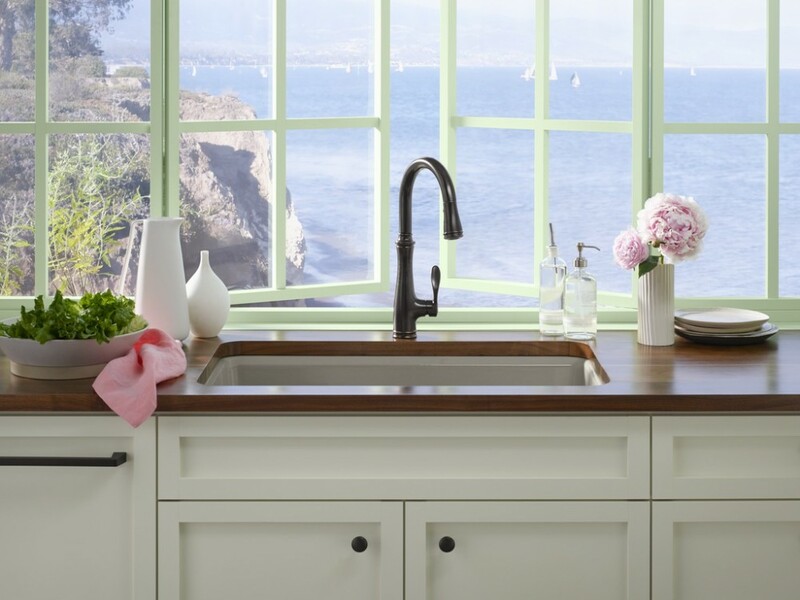 Clean white cabinetry and rich wood countertops keep the mood casual, while hummingbirds add whimsy to pastel-hued walls. 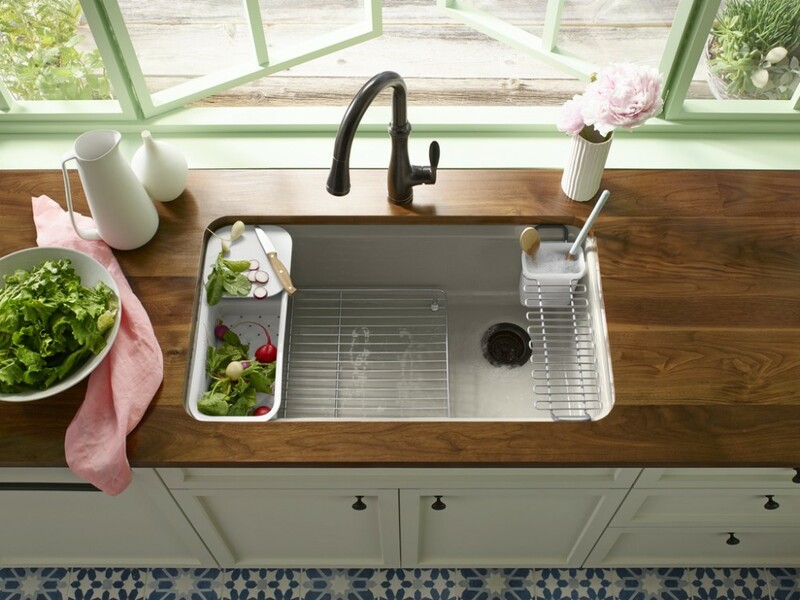 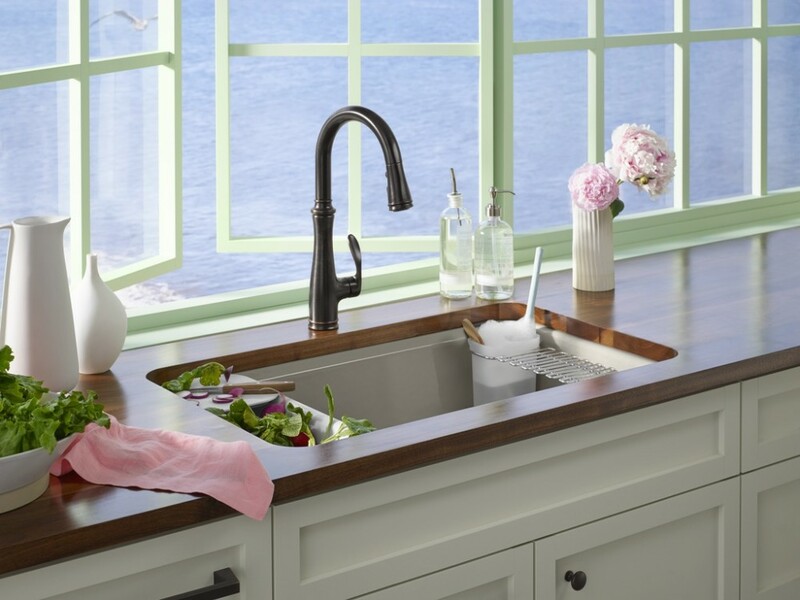 A pair of sinks, one that lends the space a vintage farmhouse style, makes it easy for a couple or friends to collaborate on culinary adventures without stepping on each other's toes. 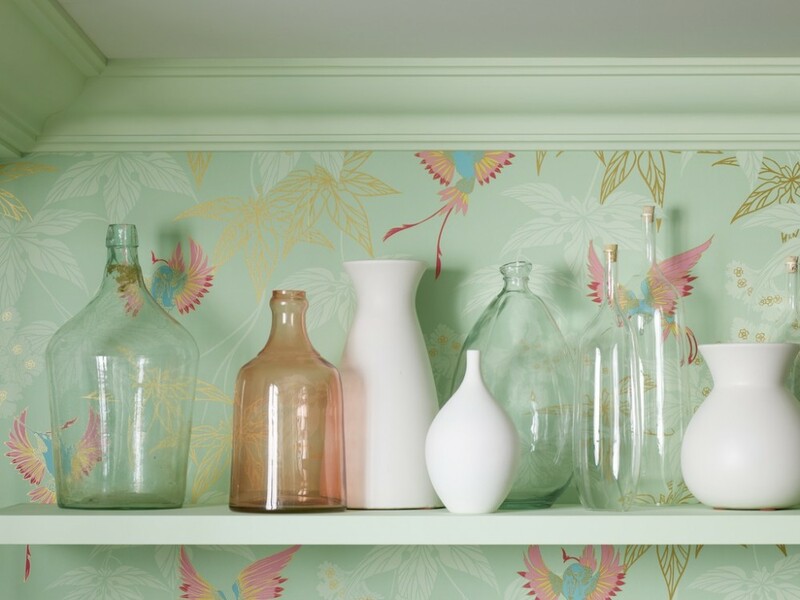 Keep accessories simple against an intricately patterned wall. 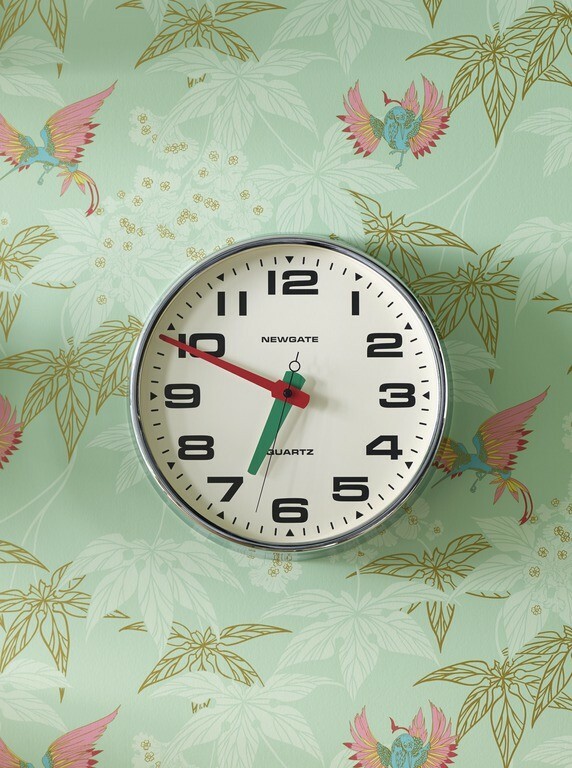 Does the right wallpaper have the power to brighten your day? 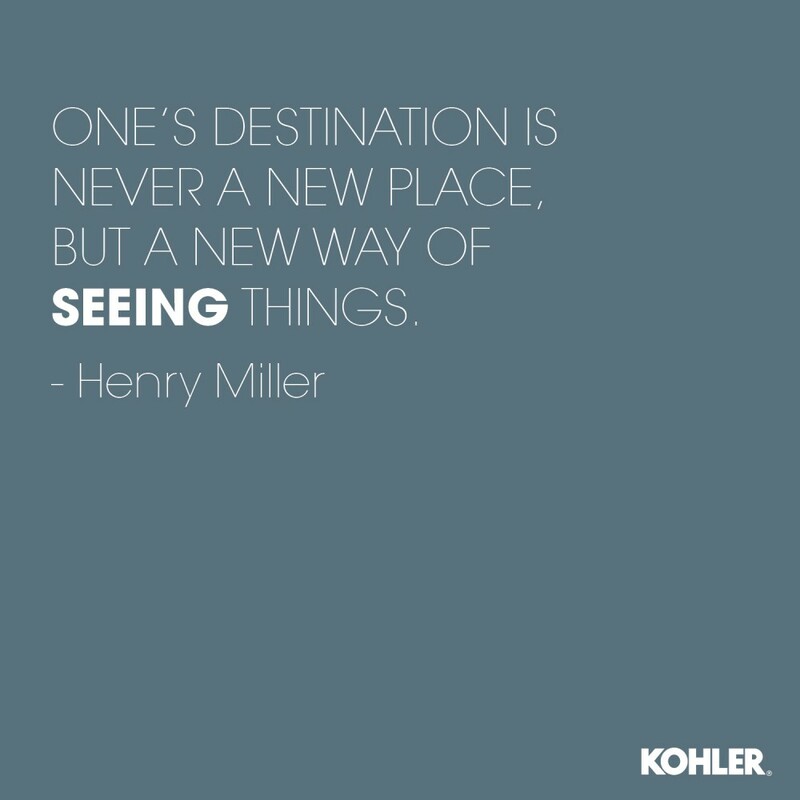 Yes, we say. 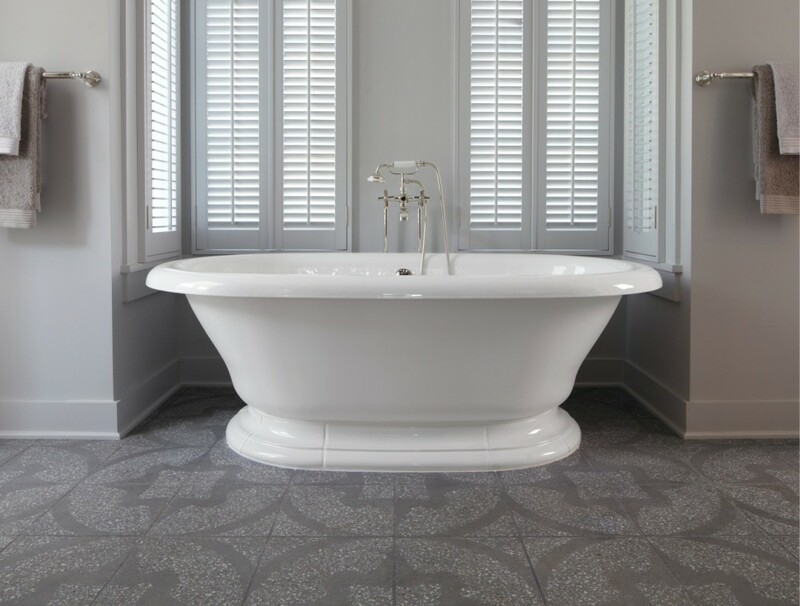 An elegant addition to Atlanta’s upscale, family-friendly Buckhead neighborhood, this classic country-colonial home manages to be grand and sumptuous, cozy and welcoming, all at the same time. 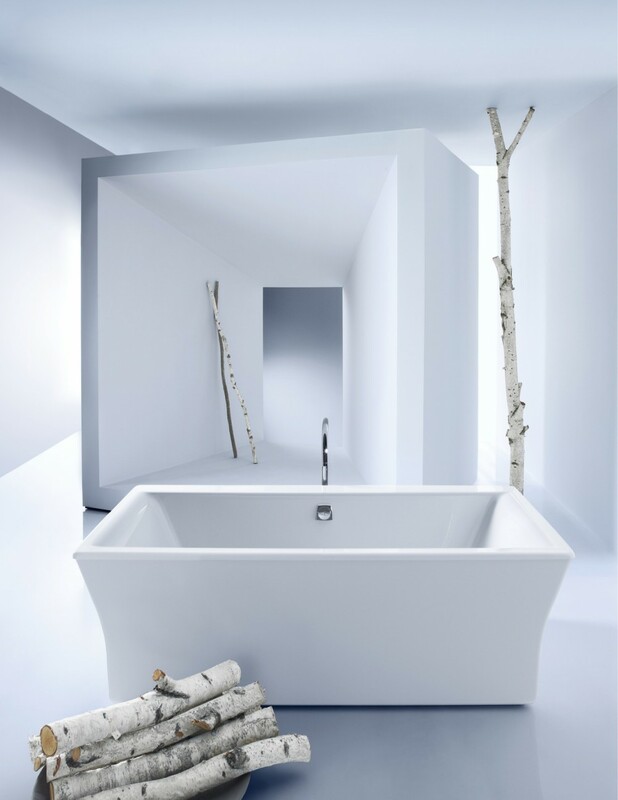 Rich textures add warmth and tactile details to the serene yet slightly edgy design. 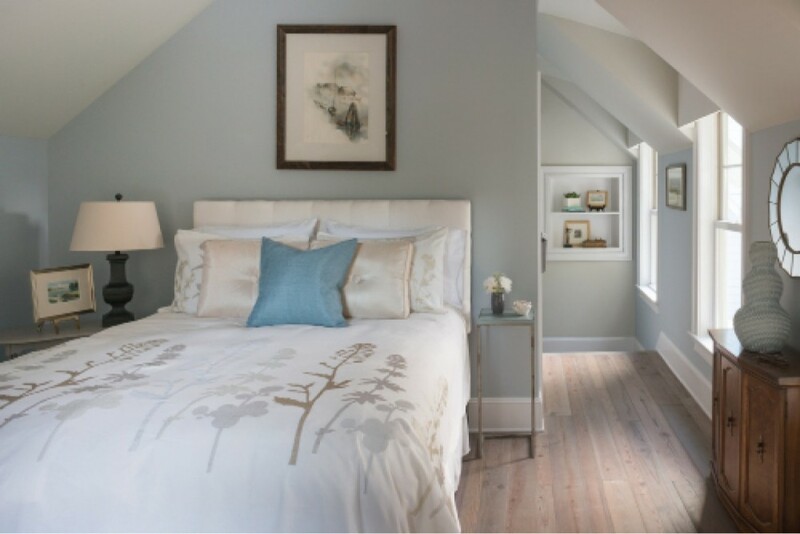 To emphasize a grand ceiling height, designers incorporated rich fabrics into their tasteful, confident guest bedroom design. 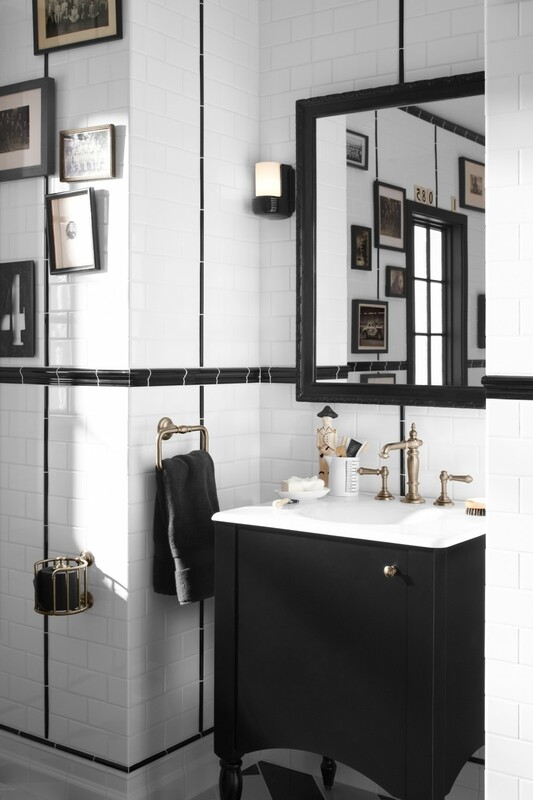 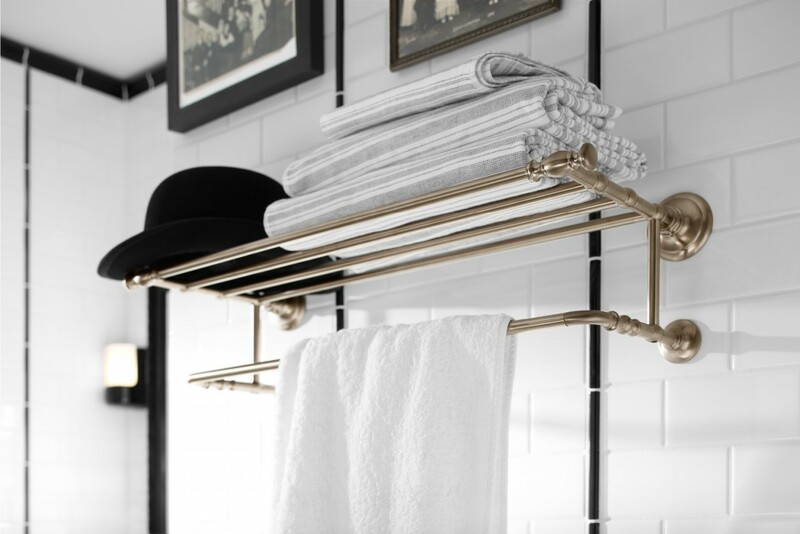 KOHLER teamed up with desinger Melike Gul on a classic, black-and-white, vintage style bathroom inspiration that’s iconic, original and slightly quirky—much like Charlie Chaplin himself. 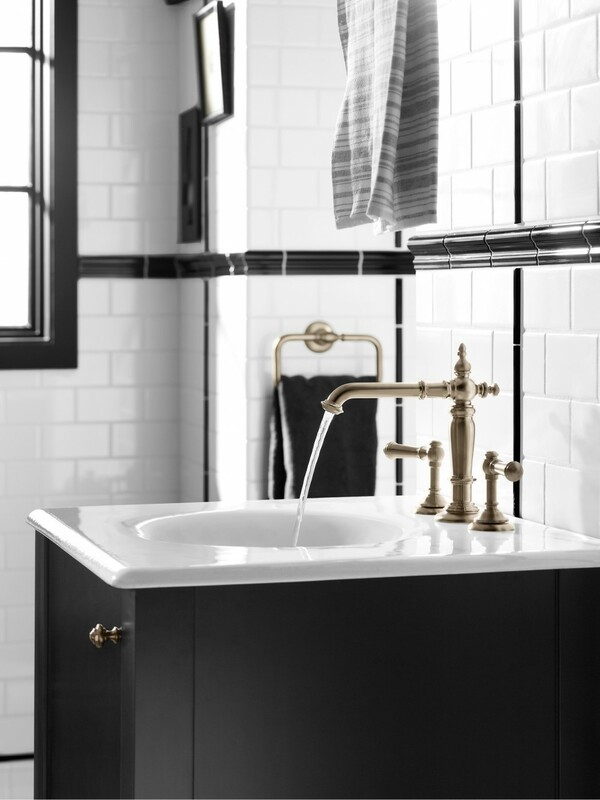 Black and white is always right, in fashion as well as home interiors. 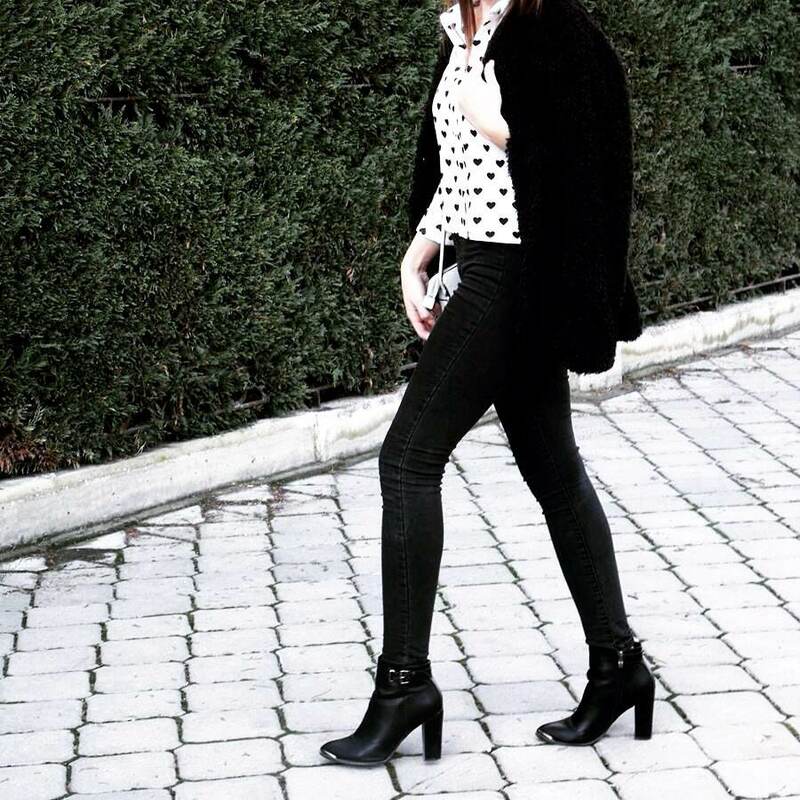 Geometric patterns and menswear-inspired brogues in a petal-soft hue. 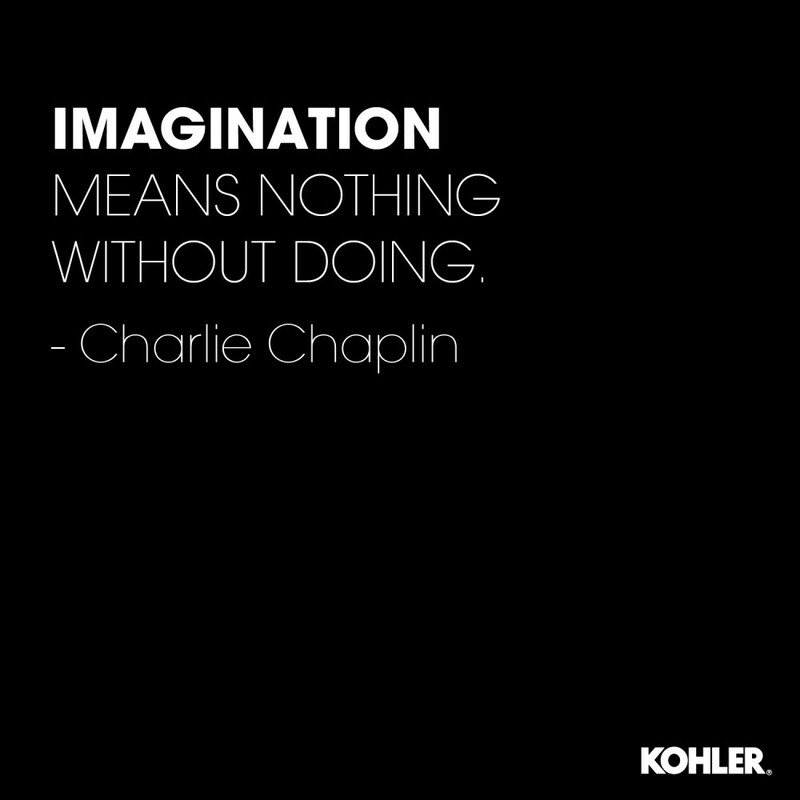 Something tells us Chaplin would have approved. 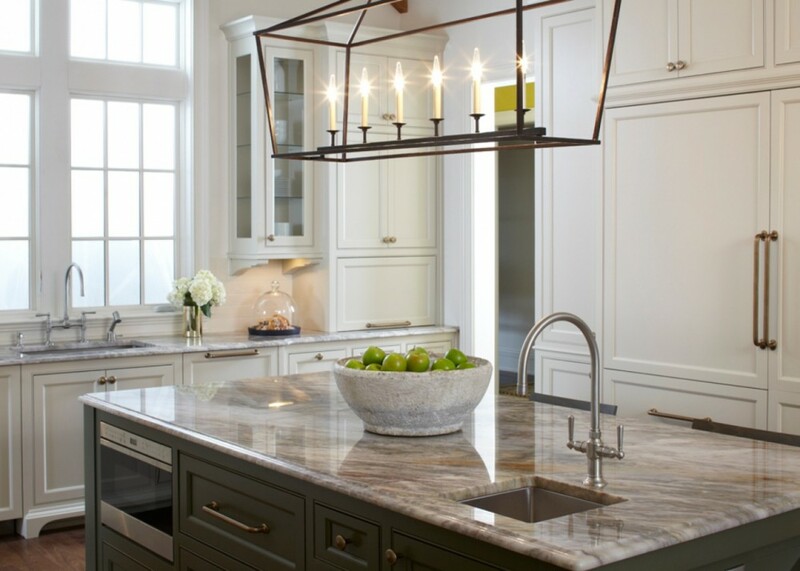 Drawing on their love for the indoor-outdoor California lifestyle and coastal South Carolina’s relaxed elegance, Rob and Lydia Mondavi created a summer home that combines the best of wine country and Low Country in one beautiful package. 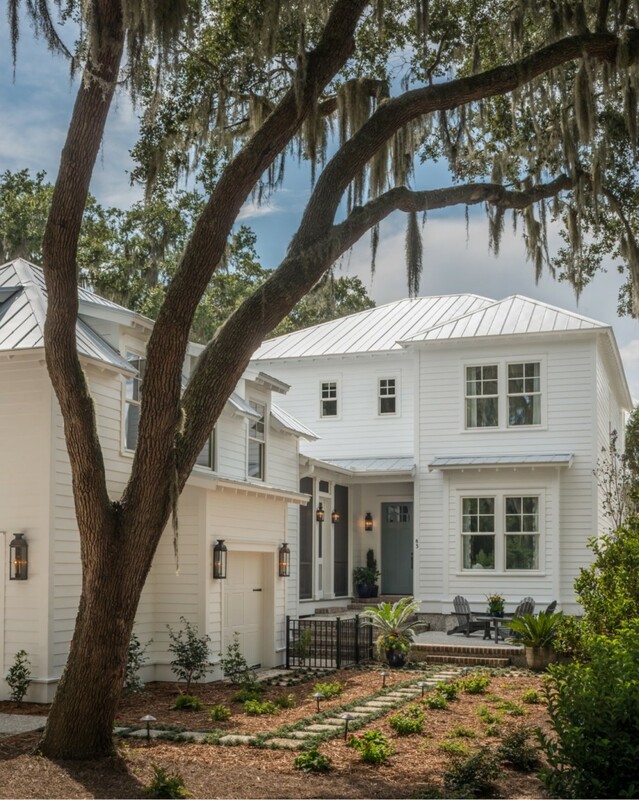 Deep eaves, exposed rafter tails, a metal roof for repelling heavy rains, and a tall live oak dripping with Spanish moss. 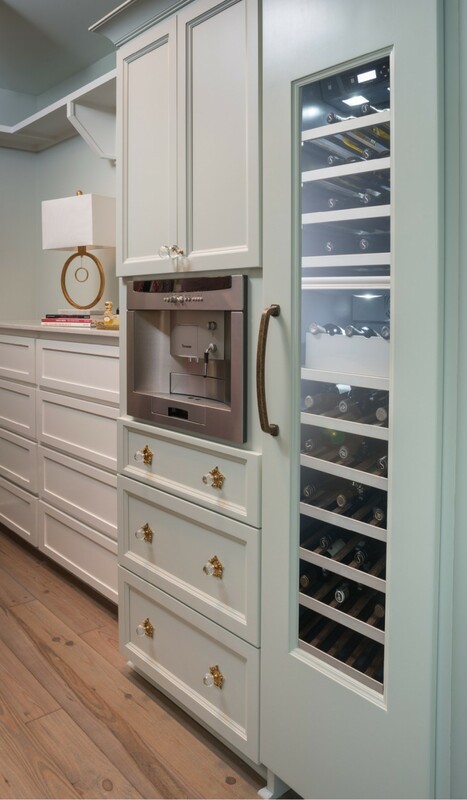 Morning coffee and evening wine are a few steps away from the master bedroom, inside its expansive closet. 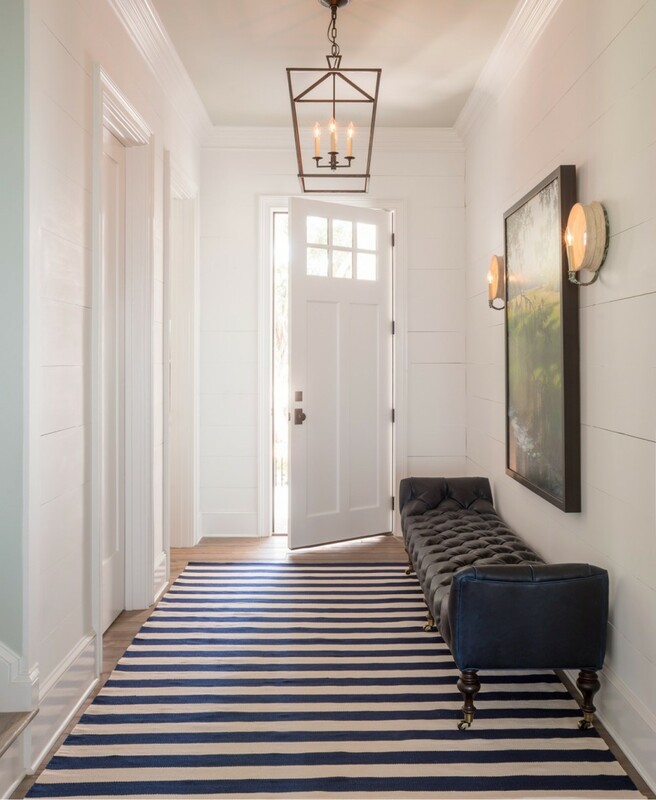 The entry hall’s classic lighting, tufted bench and no-fuss rug set the tone for the relaxed elegance of the Mondavis’ Low Country lifestyle. 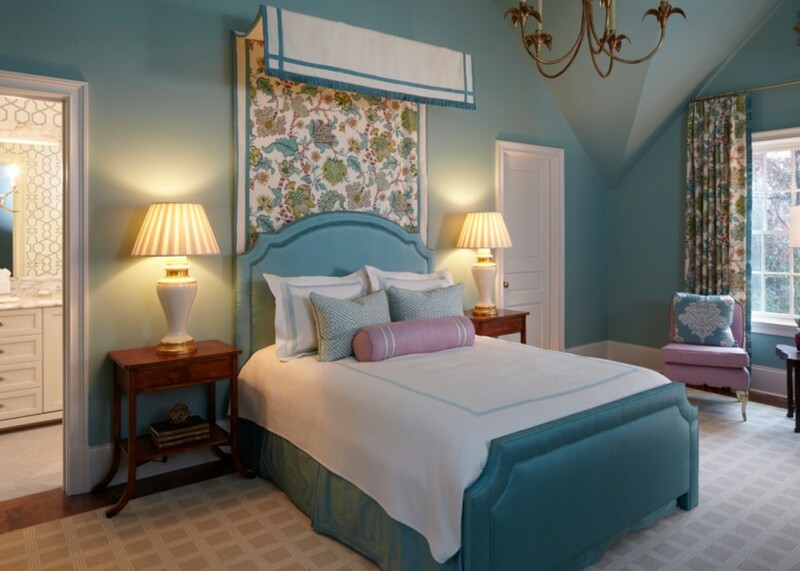 The second-floor guest room’s exuberant hues are tempered by elegant bronze accents. 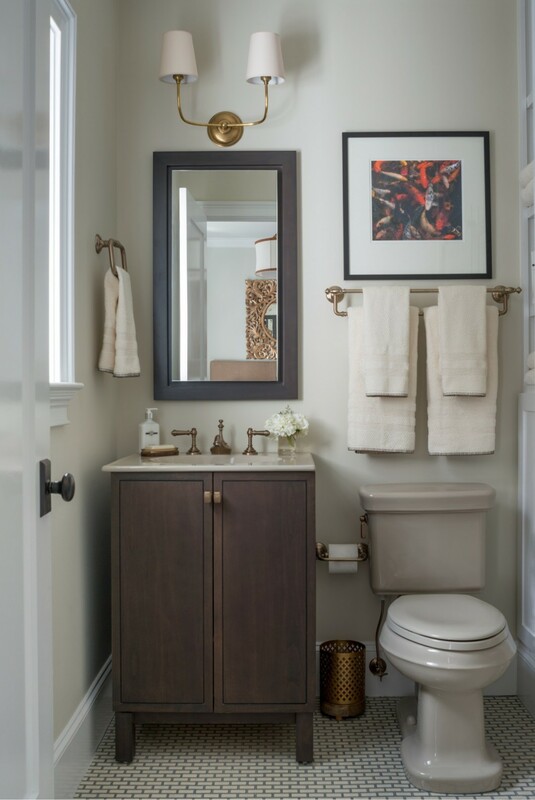 The second-floor guest bath’s palette echoes nature’s hues, with sand-colored fixtures, warm bronze faucets and a dark wood vanity. 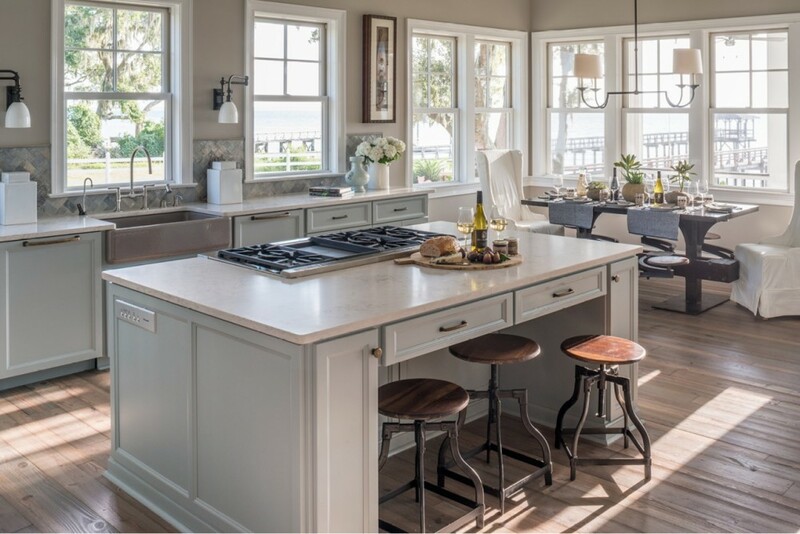 A large, comfortable screened porch welcomes breezes and views of Port Royal Sound and Hilton Head Island. 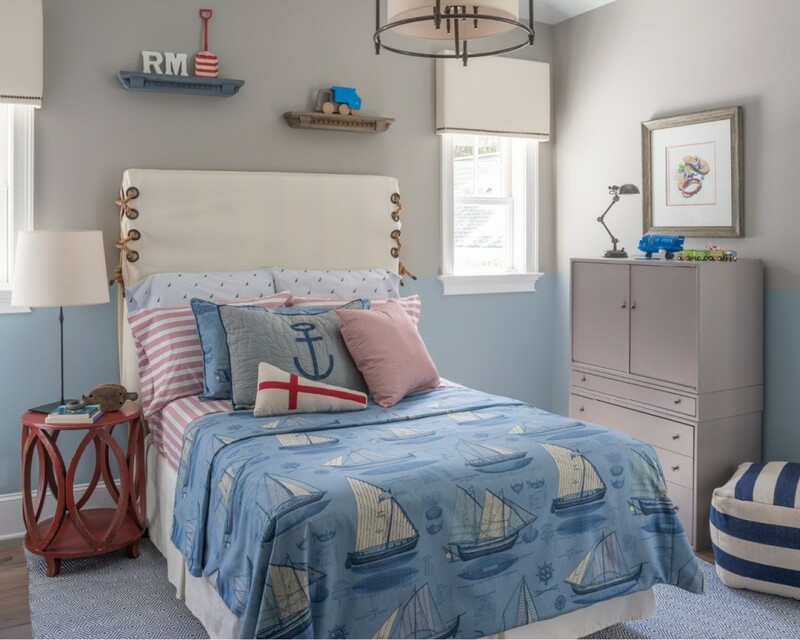 A boy’s bedroom in a nautical theme is just right for a beach house. 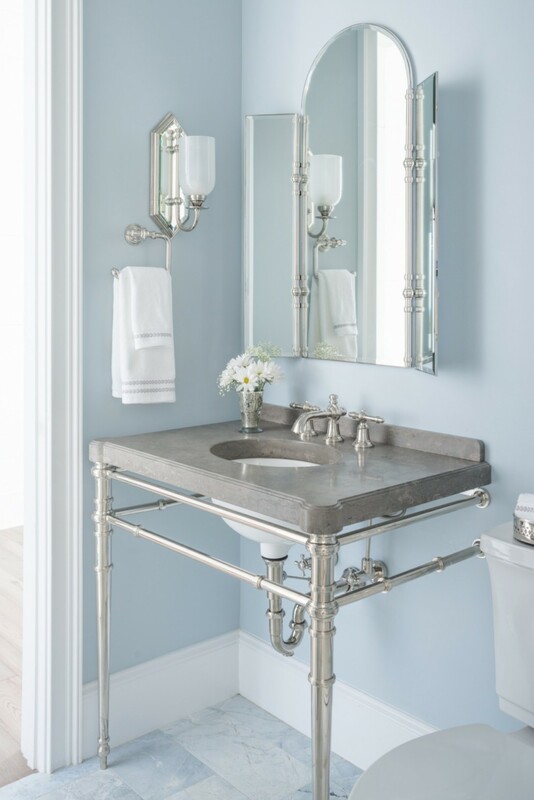 The powder room shows off a side of Southern style that’s steeped in elegance and tradition. 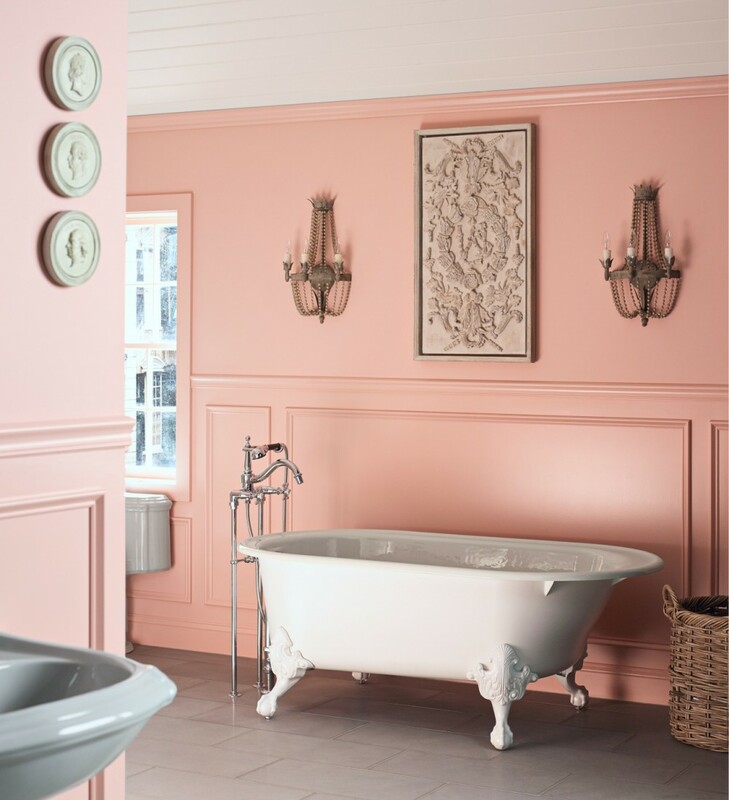 The carriage house suite serves as welcoming guest quarters, with its soft colors and cozy, coved ceiling. 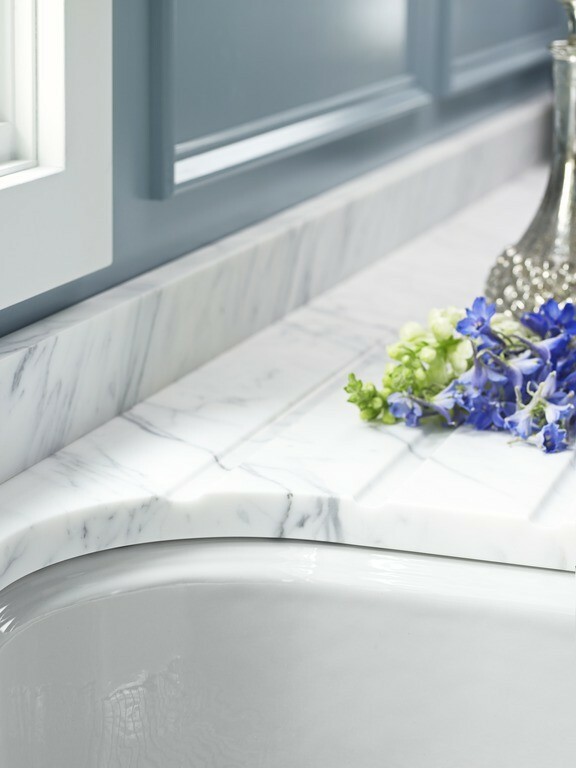 Spa-worthy sprays and sumptuous tile and stone make the guest bath extra-luxurious. 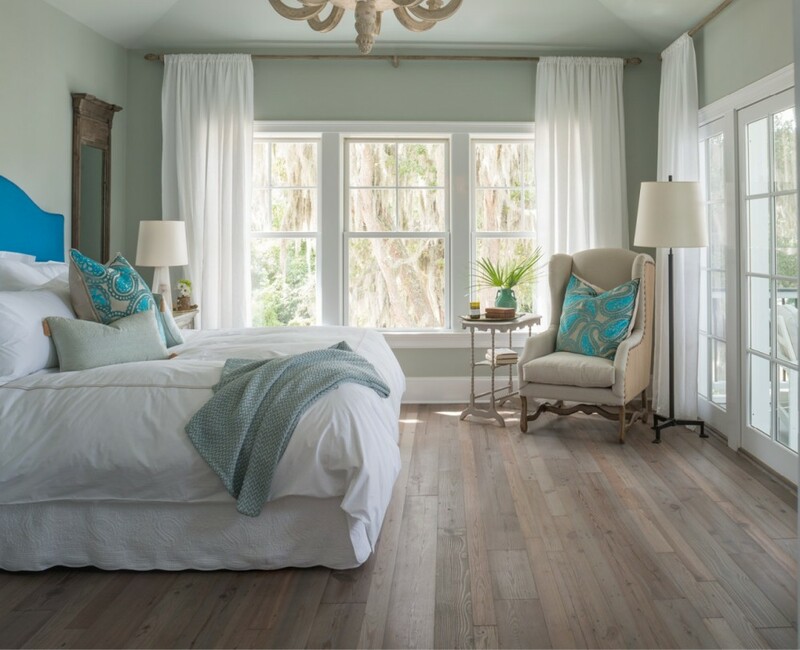 Soothing hues, softly weathered floors and views of gauzy Spanish moss make the master bedroom a tranquil retreat. 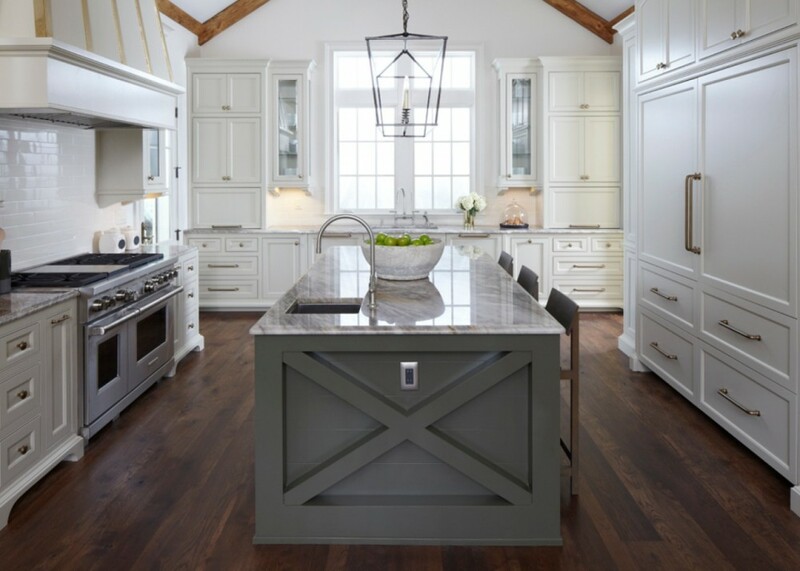 Multiple seating areas, including this wood-and-iron trestle table, accommodate intimate family dinners and big parties with equal success. 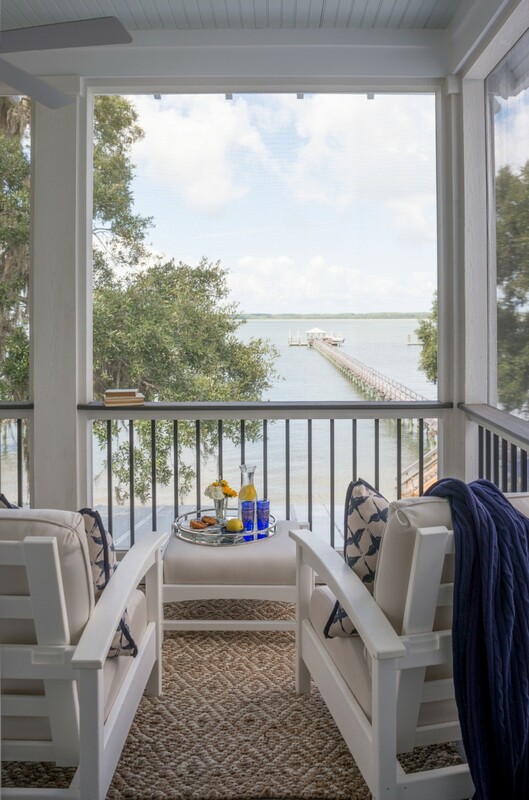 The back screen porch is a prime spot for an apres-sun snack and sip overlooking Port Royal Sound. 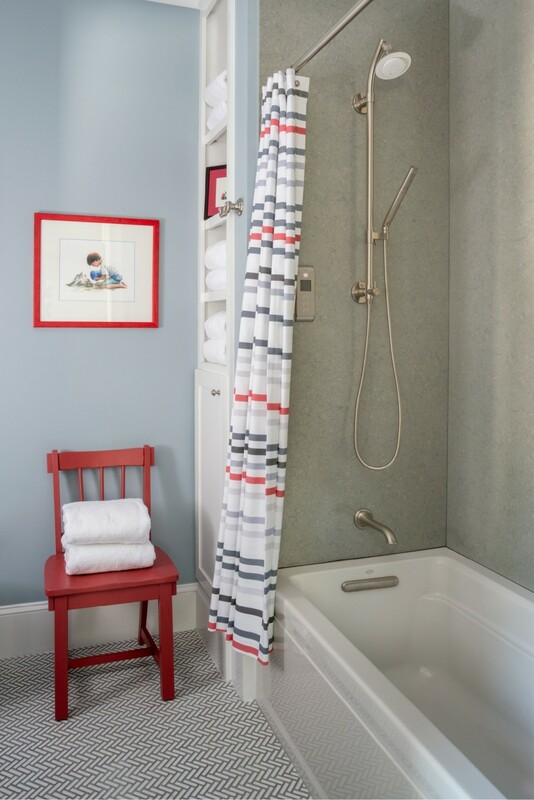 The side screened porch connects the main home with the carriage house guest quarters. 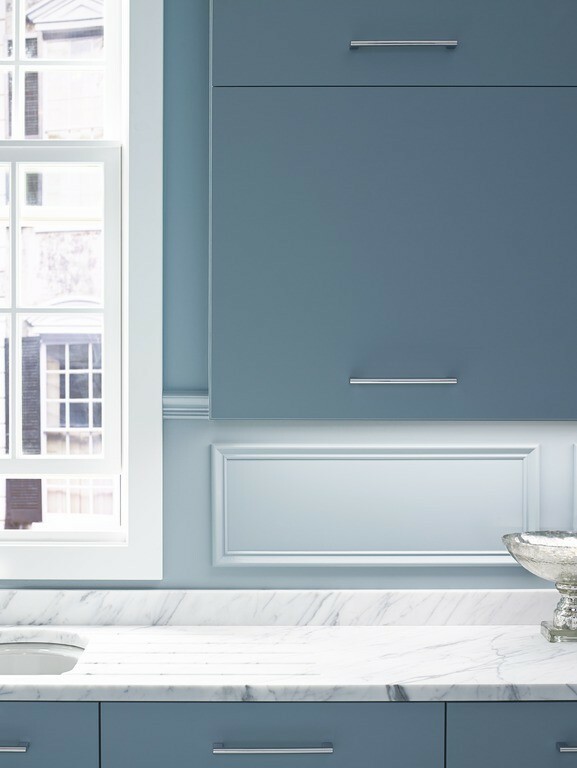 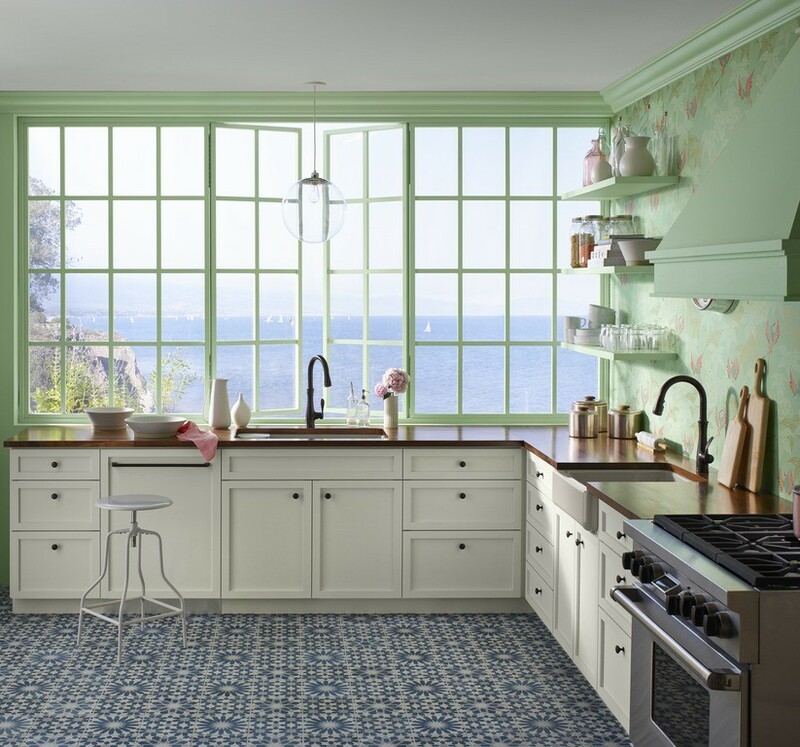 The distinctive architecture of the historic South elevates this urban kitchen, saturated with a swath of expressive color offset by brilliant white. 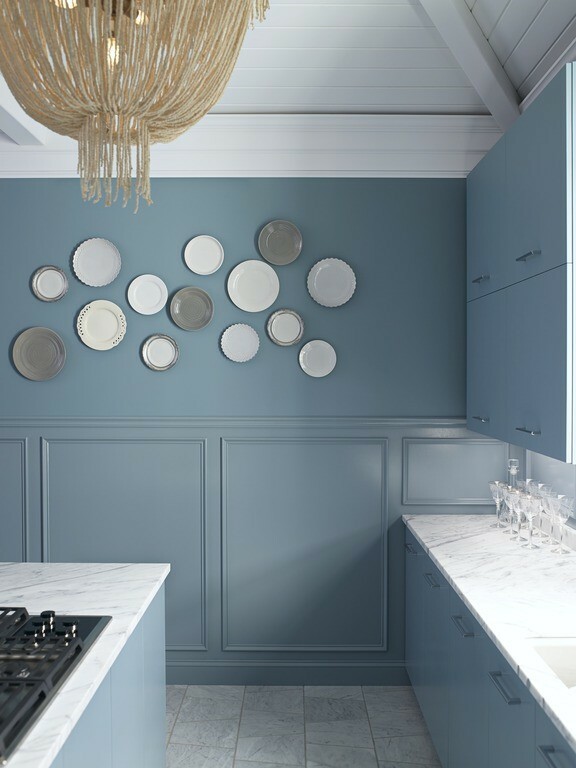 Classic elements like crisp marble countertops, paneled walls, and peaked ceilings add vintage style to a modern space. 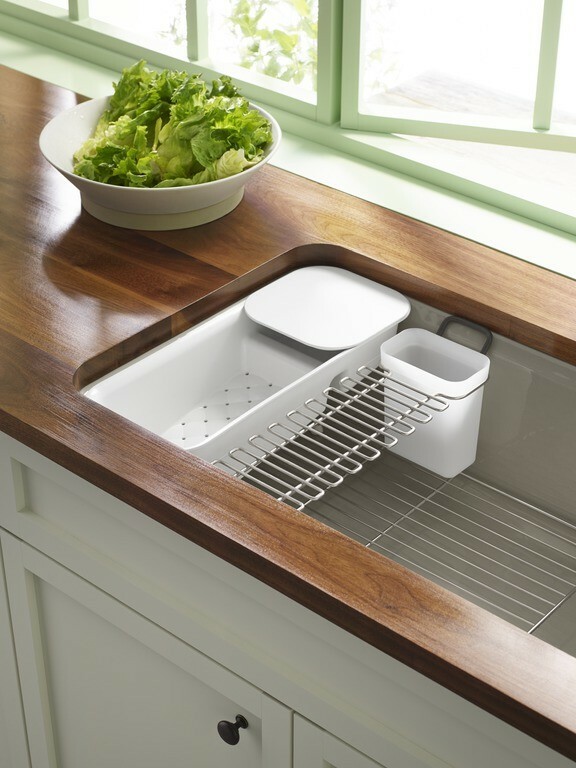 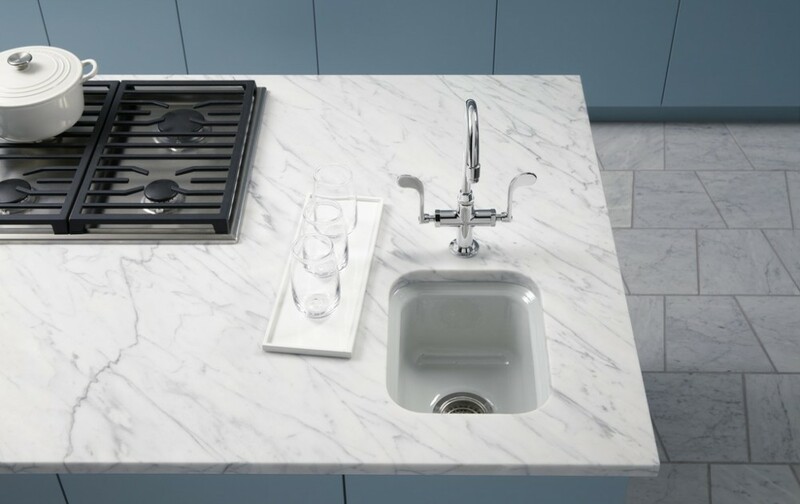 And a trio of sink-and-faucet workspaces, with two flanking the cooktop, make it as perfect for entertaining as it is for preparing intimate family dinners. 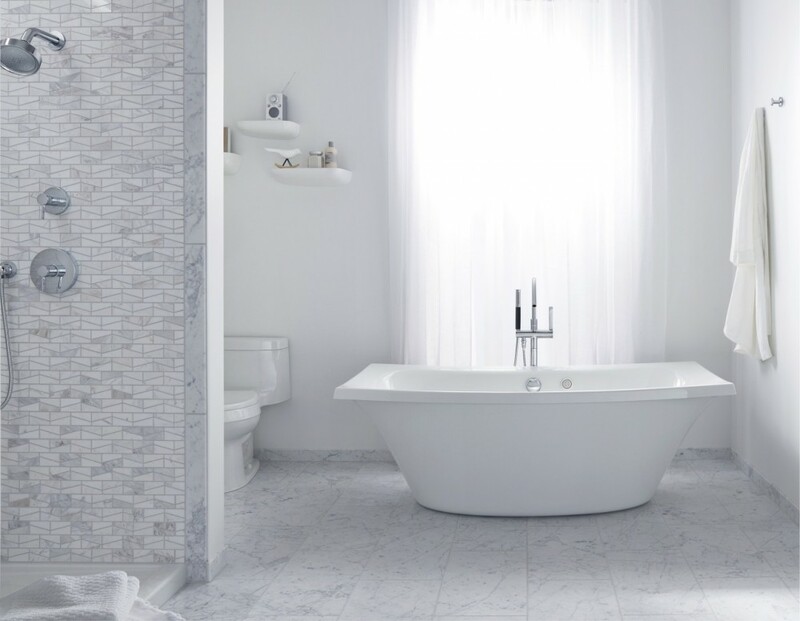 Simple shapes in white and metallic finishes add just enough interest to the space. 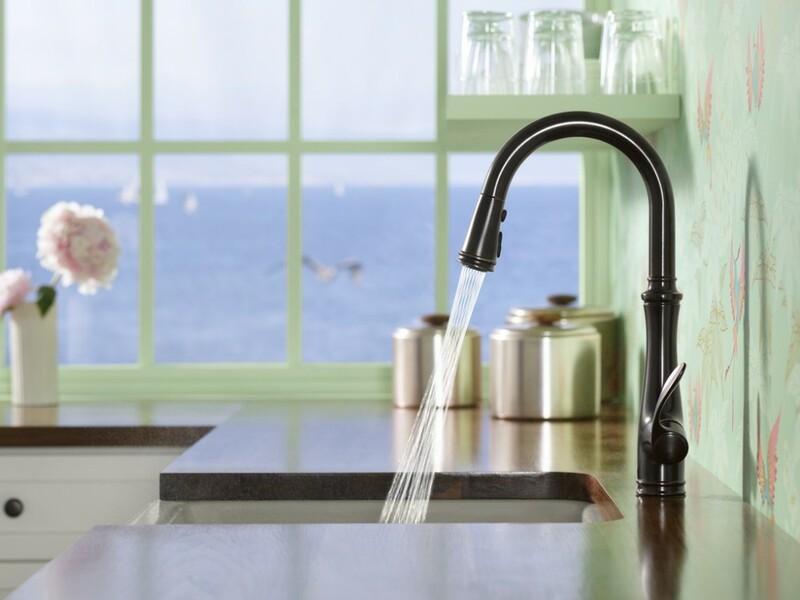 Can't you just taste it? 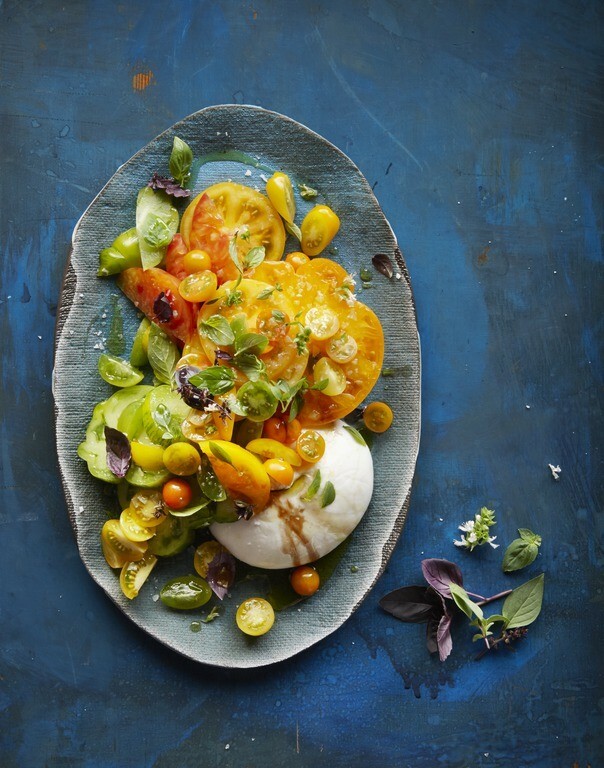 Caprese salad with burrata and heirloom tomatoes. 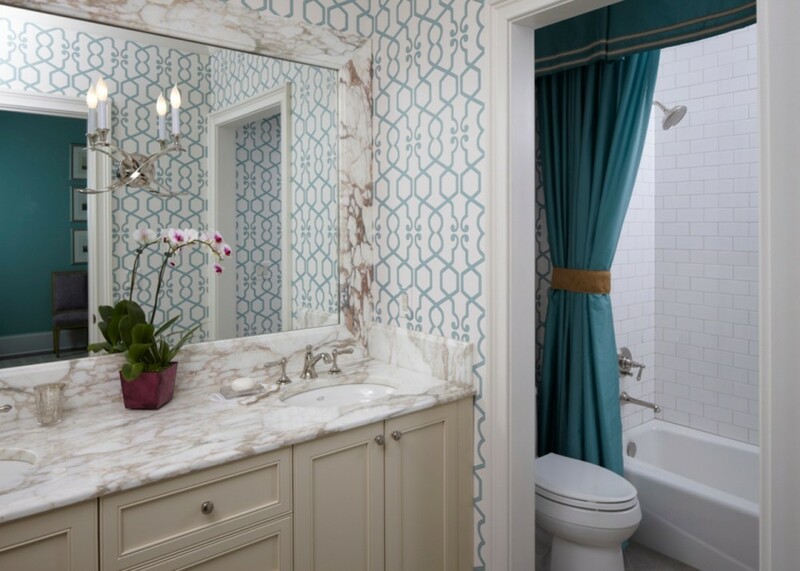 Walls with traditional detail pair with contemporary cabinet pulls for an eclectic twist on traditional style. 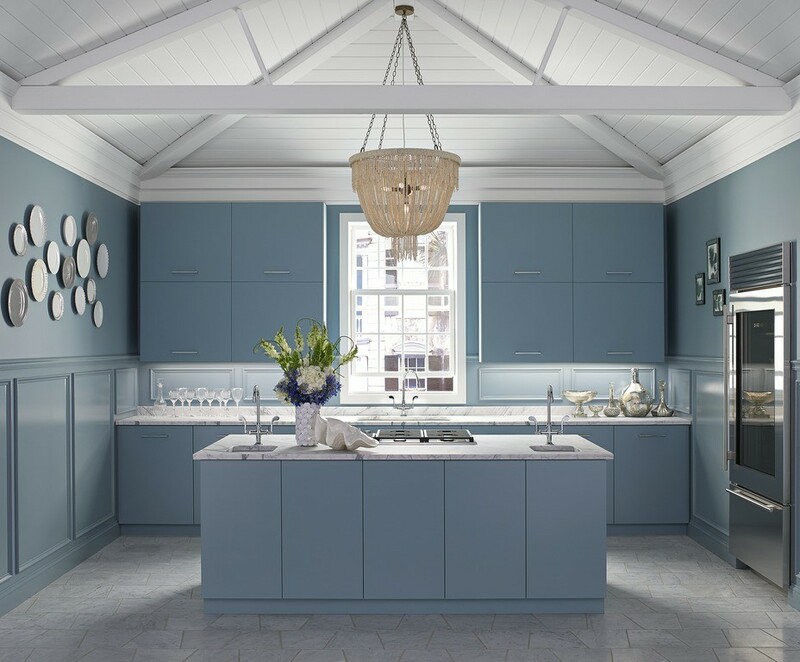 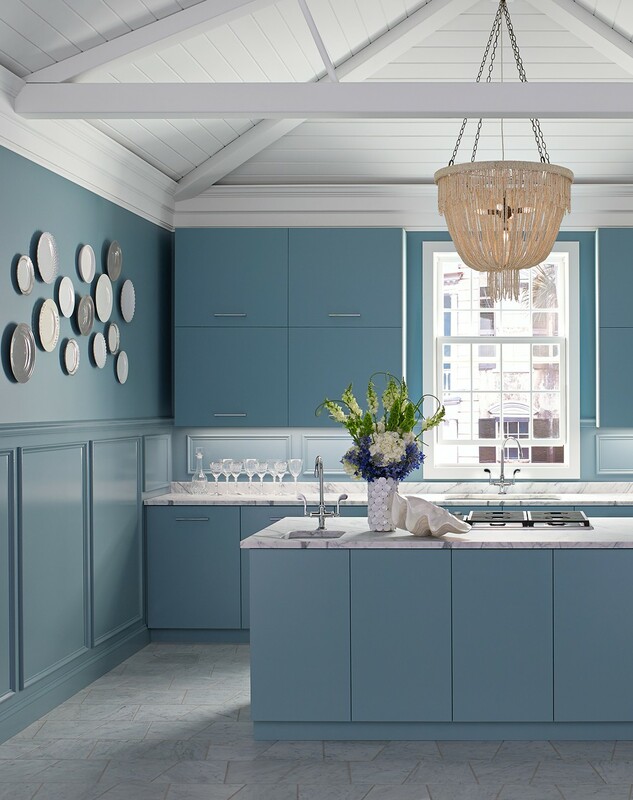 The art of food: Heirloom tomatoes add bright pops of complementary color to a true-blue kitchen. 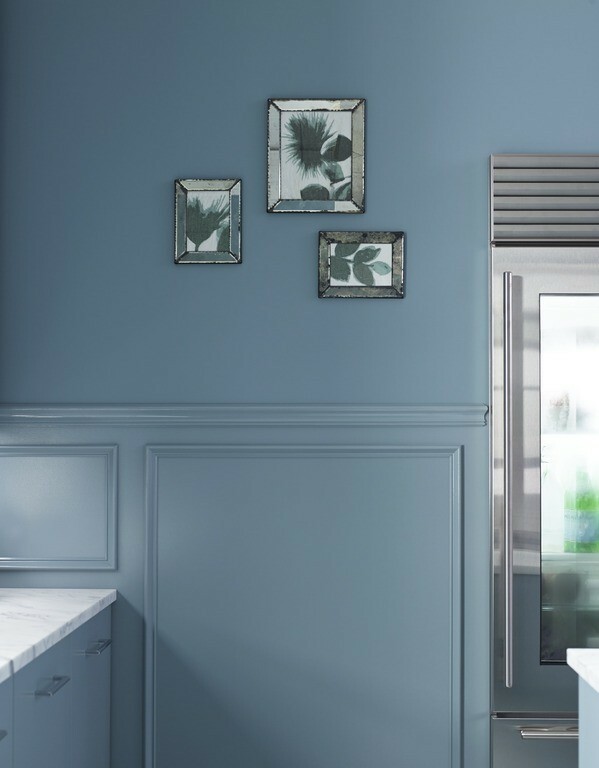 Simple, nature-inspired accents are the way to go with a color-saturated space. 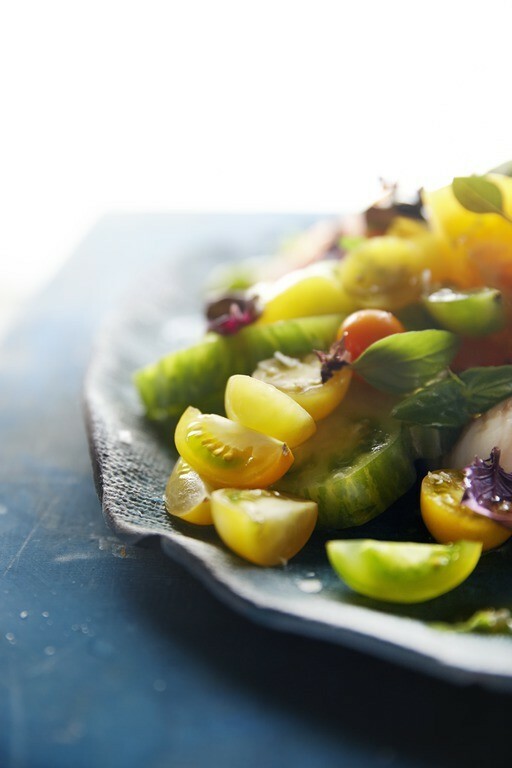 Fresh basil and heirloom tomato pair up for a caprese salad that's bursting with flavor. 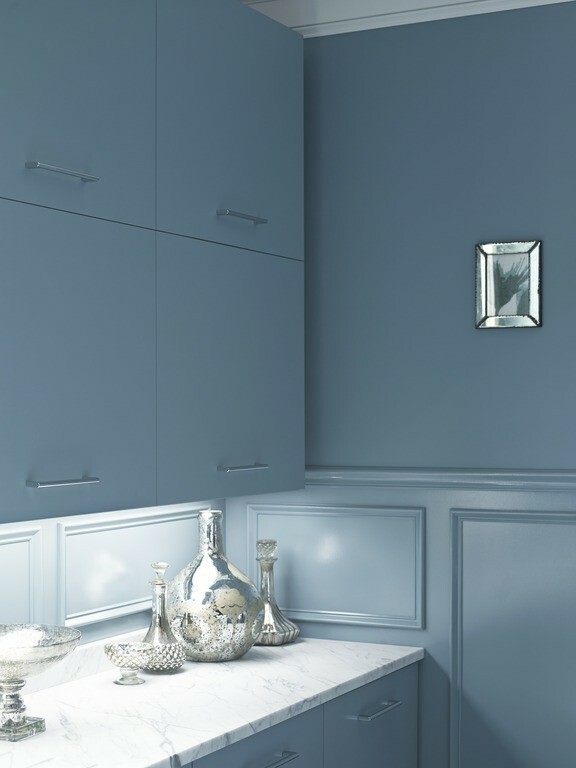 Gleaming metallic accessories keep the palette cool and the mood sophisticated. 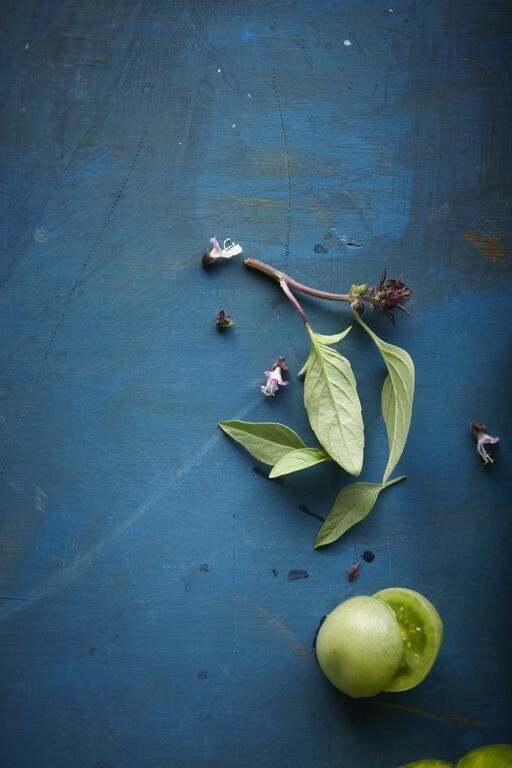 The ingredients for a fabulously fresh caprese salad are stunningly beautiful in their own right. 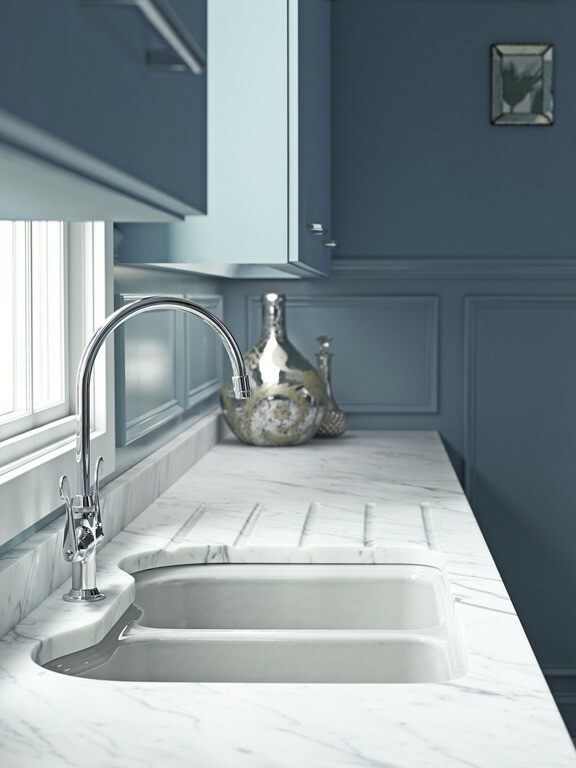 The Ice Grey Hartland sink color coordinates beautifully with cool marble countertops. 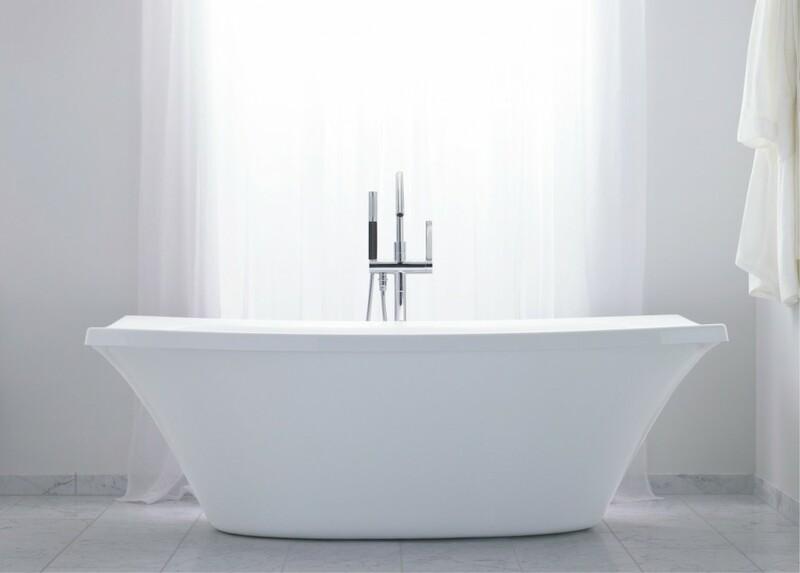 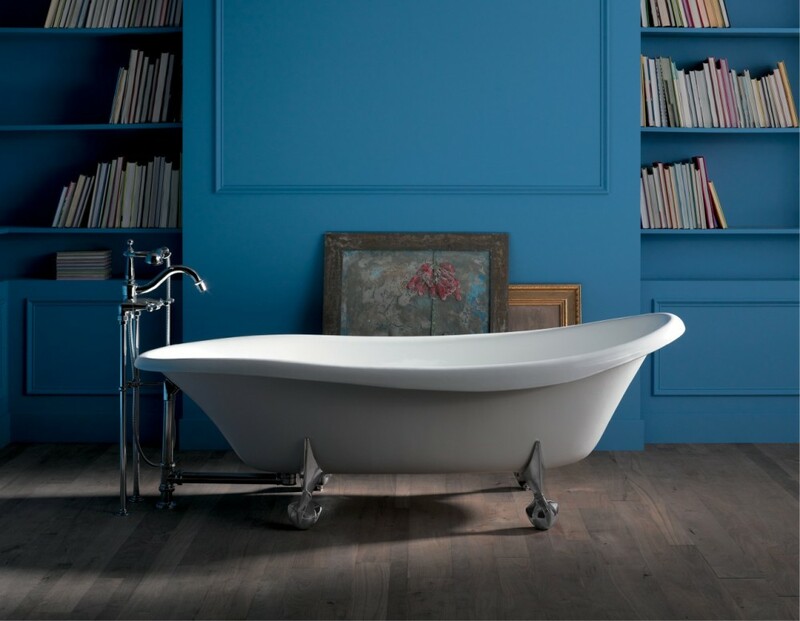 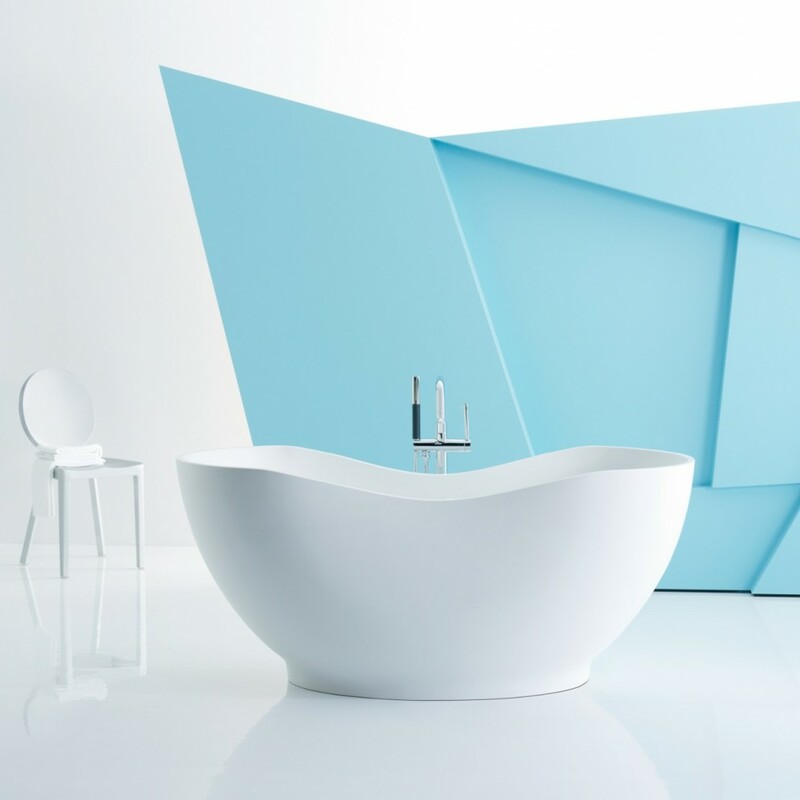 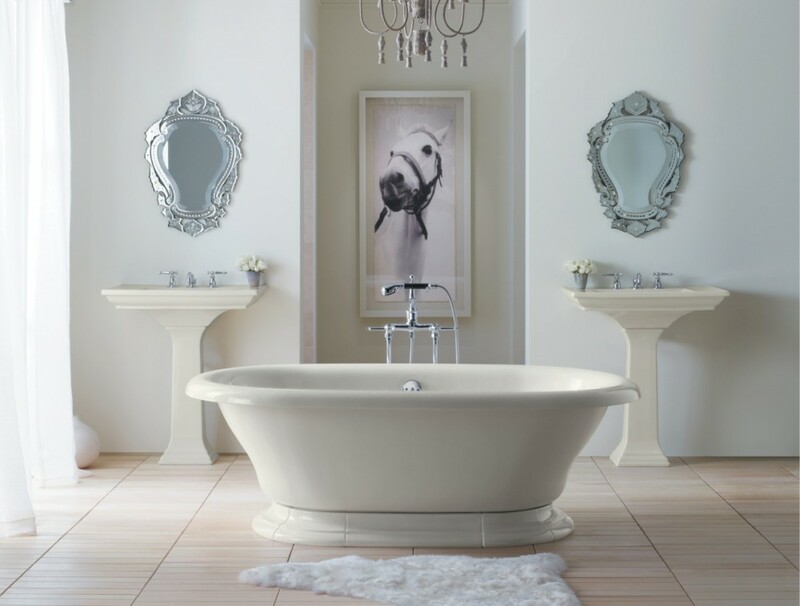 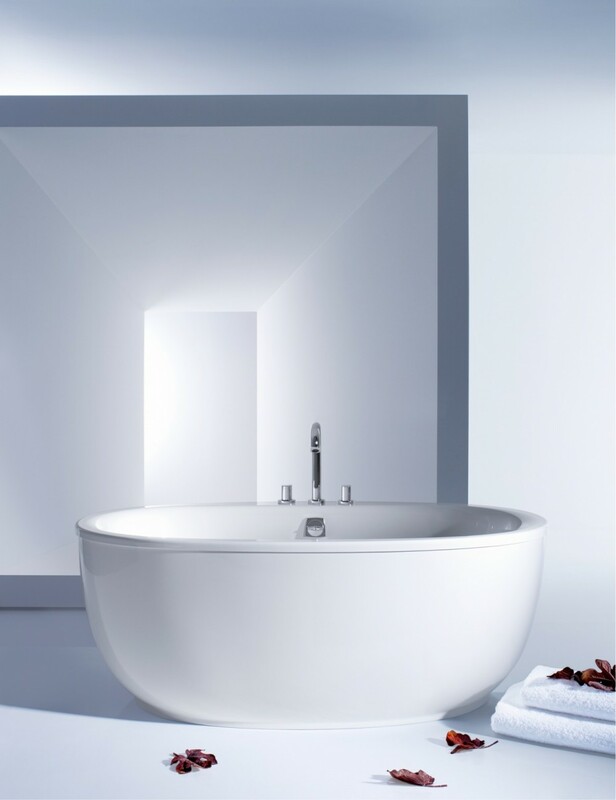 Freestanding baths are back. 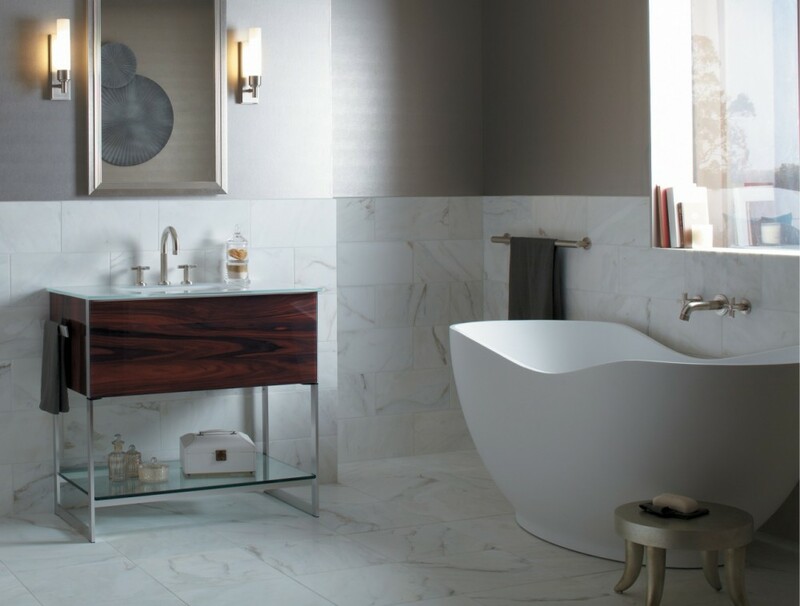 Whether you have a taste for the modern or tend to more traditional design, Kohler freestanding baths deliver distinctive character and are sure to make a bold statement in any space.